As electric vehicle (EV) use is growing, more cities are installing charging station infrastructure to help their residents’ EV operation while encouraging their use. Many cities are starting small with EV charging stations. La Crosse, Wis., is adding a single charging station to its downtown area that the local parking utility will oversee, La Crosse TV station WKBT-TV reports. The station, which Honda Motorwerks donated, may be the first of a few in the city though, as several EV owners have called the La Crosse parking utility asking for the location of the nearest EV charging station. "It seems to be that that call is increasing. So, we'll see how this one goes and then we'll decide at some point down the road if we're going to add an additional charging station," Jim Flottmeyer, coordinator for the parking utility, told WKBT. Kennesaw, Ga., also installed new EV charging stations in February, according to the Marietta Daily Journal. Decatur, Ga. — which lies about 30 miles south of Kennesaw — announced in February that it designated four parking spaces at which EV charging stations, Decaturish.com reports. The stations will take six weeks to install, but the city plans to let the stations be used for free early on. “We want to get a good feel for how they get used,” Decatur Assistant City Manager Lyn Menne told the City Commission, per Decaturish. Albeit much larger than La Crosse, Kennesaw and Decatur, Seattle has made major strides in equipping its city with EV-friendly infrastructure recently, according to Seattle Magazine. As part of a goal to get 30 percent of Seattle residents to switch to EVs by 2030, Seattle City Light opened two publicly-operated EV charging stations in the city that will eventually be part of a network of 20 stations across the city. 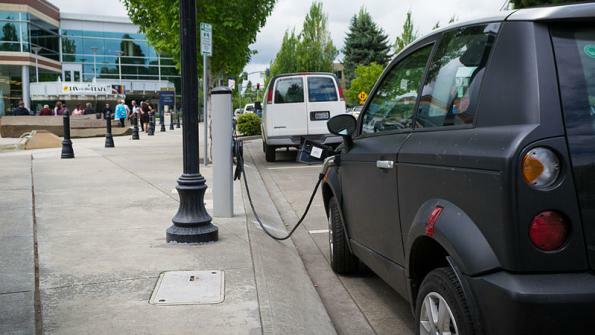 Moreover, multiple companies are seeking approval to install charging stations across the city. Earlier in February, the city also opened what a news release called “one of one of the largest indoor electric vehicle charging stations in the country” — a 156-vehicle charging facility for its EV fleet, Seattle Magazine reports.